Nicky Adams says the ambition of the Cobblers and manager Chris Wilder convinced him to sign on at Sixfields. The 28-year-old put pen to paper on a three-year deal at Sixfields on Friday, having made the free transfer switch from Bury. Adams was a key member of the Shakers’ promotion-winning team this season, having also helped Rotherham United to move up from Sky Bet League One 12 months earlier, and he wants more of the same. 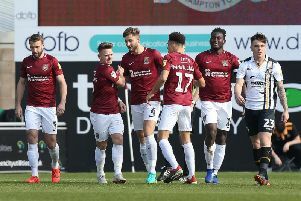 After being made available for transfer, the player revealed he turned down offers from league one clubs and instead opted for the Cobblers, because he believes their ambitions match his own. “I just love to play football and hopefully I can come here, play with a smile on my face, and we can have a go at getting promoted, because that is what me and the gaffer (Chris Wilder) spoke about,” said Adams, who has also played for Leicester City, Crawley Town, Rochdale, Brentford and Leyton Orient. “I spoke to a couple of league one clubs, but I didn’t feel they had the ambition to get promoted from that league. “I want to be somewhere where they have ambition to be promoted, and you look at the infrastructure here at Northampton and I think this is the right fit for me. Adams, who was only one year into a three-year deal he signed at Bury last summer, has admitted he was ‘shocked’ when he was told by Shakers boss David Flitcroft that he was to be transfer-listed. But he also says that, once he had met Wilder, he knew where his future lay. “It was strange,” said Adams. “I had a good season at Bury, we got promoted, and then we went away for a few days. “We came back and I was told to find a new club, and I was shocked to be honest because I had a good season and played 90 per cent of the games. “But they just said they are going in a different direction next season, so I have to respect that. “They put the list out there saying I was available, and the gaffer (Chris Wilder) enquired about me. “I came to Northampton to speak and it has moved along quickly. “After speaking to the gaffer and looking around the place, you can see it’s ambitious and they really want to have a go next year, and that’s what I want to be part of. “When I spoke to the gaffer he told me the style of football he wanted to play, and that is key really. “I spoke to a few other clubs, but after speaking to the gaffer and hearing what he had to say, I knew this was the right place for me. “I don’t know too much about Northampton. I played against them last season and they are a good side, and they play good football and hopefully that will suit me.